Ancient Egypt is one of the most popular slot themes out there. Other popular slot themes include: TV shows and movies, fruits, gems, Ancient Rome/Greece, Under the Sea, Pirates and Magic/Fairytales. Many of Novomatic’s most popular games are centred around these themes. Aside from Gold of Egypt, there are ancient Egyptian slots include: Cleopatra Last of the Pharaohs, Ramses 2, Pharaoh’s Ring, Pharaoh’s Tomb and Sphinx Mysteries. Gold of Egypt has a lot going for it and attracts many slot players. First of all, Gold of Egypt is a jackpot slot! You will be able to see the jackpot amount when you play the game as it will always be displayed at the top of the reels. Gold of Egypt also has Free Games, Wild symbols and Scatter symbols. 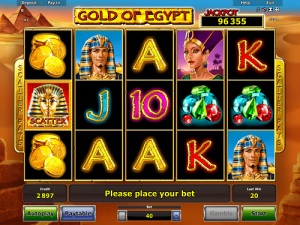 Another novel feature of Gold of Egypt that attracts players is the fact that this slot has scatter pays. Scatter pays mean that symbols can pay out from any position and don’t have to land on paylines! There is nothing more frustrating than playing a slot game and getting matching symbols but not seeing them land on a payline. In Gold of Egypt, you can say goodbye to frustration and hello to big wins! As long as you spin enough of the same symbol, they will give you a win no matter where they land. The only downside to Gold of Egypt is the RTP (theoretical payout percentage). In this game, it’s 93.99%. While Novomatic games don’t always have the highest RTPs, this is low even for them! Ancient Egypt was a civilisation ruled by Pharaohs. These Pharaohs were like Kings and Queens. They were rich, powerful and adorned in gold! Their jewellery, their clothes, their headdresses, their make up and their tombs were all filled with this precious metal. Pharaohs were buried in the famous pyramids. You can see the Egyptian desert behind the reels of this Novomatic slot game. several pyramids and sphinx statues are glowing in the golden sunset! Both a handsome male Pharaoh and a beautiful female Pharaoh are the symbols which give out the highest-payouts. The golden coins and the gemstones give the next highest-payouts. The card value symbols (the Ace, King, Queen, Jack and the 10) give the lowest payouts. All symbols pay in scatter so it really doesn’t matter in what positions they land – as long as there are enough of them. Every symbol, except the male Pharaoh, has to have at least 5 matches to pay out. The male pharaoh, on the other hand, will pay out from only 4. Unlike many other Novomatic slots, Gold of Egypt doesn’t have any Wild symbols. The Scatter symbol is a golden mask of a Pharaoh, made for a sarcophagus! A maximum number of 5 Scatters may land on the reels in any one spin. 2 or more Scatters give a payout and 3 or more Scatters give a payout plus 10 Free Games! During the Free Games, an additional feature becomes active and this makes it way more likely that you’ll win the jackpot. To win the entire jackpot 100%), you’ll need to fill the reels with 15 x male Pharaoh symbols! 15x any other symbol will give a percentage of the jackpot (female Pharaoh = 40%, golden coins = 20%, gemstones = 20%, A or K = 12% and Q, J or 10 = 10%). At the beginning of the Free Games, the slot will select one special symbol (any symbol excluding the Scatter symbol). Every time this symbol falls on the reels during the Free Games, it will freeze in place while the reels continue to spin. Each additional matching symbol will also freeze in place and the wins will be paid each spin and added up. It pays to get a high-paying symbol as this special symbol at the beginning of the Free Games. Imagine if every spin you add more of the same symbol and end up getting the jackpot! Before the free games, you’ll be crossing your fingers for the Phraraoh!